Back in the spring of 2012 I read a review of Kimber’s newest rifle in the 84M line, the “Mountain Ascent”. 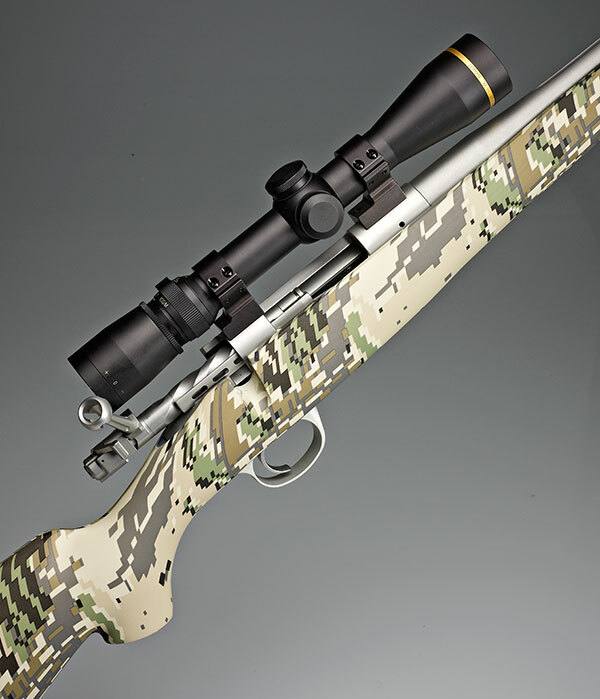 Kimber revealed the new rifle at the 2012 SHOT show to rave reviews. I was intrigued with the idea of an ultra-light production rifle. My brother owns a Kimber Montana in 300 WSM which shoots sub-MOA groups and weighs 6 lbs 3 ounces without a scope. The Mountain Ascent scales this back to 4 lbs 13 oz. At around $1750 the rifle isn’t cheap, but still considerably less than a custom rifle of comparable weight. I love my Nosler Custom 48 in 300WSM. It’s incredibly accurate; I’ve shot sub 3″ groups at 500 yards with the gun. But at 7.5 lbs empty and 9 lbs scoped and fully loaded, it’s no ultralight. Throw a bi-pod on there and after a couple of weeks of long days climbing mountains you’re ready to consider other options. I have found myself in situations where I didn’t need the Nosler’s 600 yard ability. In 2012, hunting elk in Idaho’s steep Clearwater National Forest, we were faced with daily climbs out of deep drainages. It was so thick in there that I left my rangefinder in camp; a shot over 150 yards would have been a miracle. An ultralight in .308 would have been a perfect rifle to tote in that country. After I took an elk this year, we had a few days left to help my brother fill his tag. My deer license was still in my pocket, so I carried my rifle along just in case the right buck stepped out. A light rifle would have been perfect in that situation where my deer hunt was not our primary purpose. While I still consider the Nosler my “go to” rifle, the light weight of this little Kimber combined with the potential for superb accuracy gave me a good reason to find room in the gun safe. After all, that’s what we’re all looking for isn’t it? A good reason to justify owning another rifle! Initially, Kimber advertised that the Mountain Ascent would be offered in both short and long action configurations and chambered in several calibers. I was buying this rifle justified solely on the light weight, so I decided to opt for the short action. Since I was looking for a potential back-up elk rifle, the .308 Win seemed to be the best option in the short action. I had never considered the .308 a potent elk cartridge, so I did a little research and was surprised with what I found. While the .308 can be found loaded in a number of bullet weights including 150 and 180 grain, the 165 grain provides the best overall ballistics characteristics. Leading the pack is Federal with their Vital Shok 165 grain Trophy Bonded Tip in the “High Energy” line, P308TT4. This rocket leaves the muzzle at 2880 FPS with over 3000 ft/lbs of energy. Hornady loads their 165 grain Interbond bullet in the Superformance line of ammunition. It leaves the muzzle clocking 2840 FPS with almost 3000 ft/lbs of energy ! Nosler is loading their 165 grain Accubond in the Trophy line with muzzle velocity of just under 2800 FPS. These are incredible velocities for the .308. The Trophy Bonded, Interbond and Accubond are all premium, bonded bullets known for weight retention and penetration. These bullets have great ballistics coefficients of around .450, resulting in excellent downrange retained velocity and energy. At 400 yards, the Federal Vital Shok P308TT4 retains over 1600 ft lbs of energy, plenty for elk. Modern bullets and powders have significantly improved many cartridges’ performance. The .308 is an example of a round that was once considered marginal for elk thats become an outstanding choice out to 350-400 yards. I checked with Kimber and they were planning on starting shipments of the rifle in early summer. I popped into Shedhorn Sports in Ennis, Montana and put my name on the top of the list for a Mountain Ascent. Then I waited. And waited. I called Kimber in August and was told that production of the Ascent had been put on hold due to excessive demand for Kimber’s 1911 handguns. I checked back after the hunting season ended as was told that they had began shipments just a week earlier. True to their word, it was only a few days later when I got the call from Shedhorn that my Kimber had arrived ! At first appearance, the rifle seemed everything I had hoped for. Several customers gathered around the gun counter as the rifle came out of the box. All marveled at the weight. In hand, it felt even lighter than advertised. Kimber started by trimming the stock lines a bit. The stock is constructed of Kevlar-reinforced carbon fiber and weighs only 20 ounces. I was happy to see a 3/4-inch thick soft recoil pad adorning the stock and noted that Kimber didn’t try to cut weight by eliminating sling swivels. The pattern on the stock is Gore’s Optifade Open Country Concealment. You see it usually used on Gore’s Sitka Gear line of camo wear. I am withholding judgement on the camo stock at this time. I THINK I like it.. and perhaps it will grow a little more on me more in time. It will certainly make the rifle harder for game to see ! But I don’t want to lay it down in the weeds somewhere. To save weight Kimber uses a blind magazine versus a hinged floorplate. Since I usually shuck my shells using the action anyway, this was of little note. The action holds four rounds and sits on an aluminum pillar bed. A nice touch from Kimber was the inclusion of Talley lightweight aluminum scope rings with the rifle. Aluminum was also utilized for the Mountain Ascent’s trigger guard. To further reduce weight, the bolt body has been spiral fluted. As I worked the action, I could feel the fluting pass through the receiver. It doesnt bind or anyway impair the workings of the action, but I noted it detracted from the smoothness. The extractor and bolt handle have been lightened with fluting and the bolt knob hollowed. Finally, Kimber cut the barrel length to 22″ and fluted the first third of the barrel from the action. While thin, it looks proportional to the rifle. Kimber has added a removable muzzle break to help control recoil, which extend the barrel to a visual 24″. The .308 cartridge is one of the better at minimizing loss in velocity with drop in barrel length, but I still expect to lose 60-80 FPS from advertised ballistics with the 22″ barrel. I mounted a Leupold VX3 4.5-14x40mm scope with the CDS (Custom Dial System) on the rifle. The scope weighs 15 ozs and brings the total weight of the rifle with scope and rings to 5 lbs, 14 oz. I have been using ballistics reticles; Leupold’s Boone and Crockett and the Zeiss Rapid Z, on my rifles in the past This is the first adjustable turret scope I have tried and I am excited about the independent reviews I have read on this system. Basically, once you lock in the round you are going to shoot, Leupold creates a custom elevation turret for your scope using the exact ballistics and sighting information you provide. I don’t expect to be making too many long range shots with this rifle, so this system keeps my scope reticle clean and gives me the option to dial in for longer shots if the conditions are right. The 1″ tube and 40 mm objective lens keep the scope lines trim. I am not a fan of the larger objective lenses for rifles that spend a lot of time in a scabbard on a horse. They are bulkier and just seem to offer a larger target to get knocked out of alignment. I opted for the 14 power scope as its dimensions and weight are essentially the same as the 3.5×10 and an extra 4 power can come in handy when looking over a prospective mule deer or antelope. So when, and if, .308 ammo ever becomes available again, it will be time to take this baby to the bench and see how she shoots. I am hoping to pick up some Hornady Superformance first and see how it papers. If I get decent results I will probably stop there as the round provides superior ballistics to other commercial loads. To see how this girl shoots, ( and at 4 lbs 13 oz, this baby will carry a feminine name!) check back in a few weeks for the results from the bench! Last weekend I stopped by Shedhorn Sports in Ennis, Montana to see if they had received any H4350 powder. It seems like every sporting goods store in Montana has been stripped of reloading supplies and ammo so I was suprised to find not only the powder, but some Nosler Trophy Grade ammo in .308 loaded in Nosler’s 165 Accubond bullet. I picked up a couple of boxes and on February 12th the weather turned nice enough to put a few rounds through the Mountain Ascent. I did a quick bore site to get the rifle on paper. Although I was anxious to see how the Kimber shot ( “The only interesting rifle is an accurate one..” Col. Whelen. ) I was actually more interested in the recoil. This was a 4 lb 13 oz gun and I was anticipating it would be substantial. I was pleasantly suprised at not only the mild recoil, but the moderate noise. The rifle wears a muzzle brake to control recoil but at the expense, I thought, of ear splitting muzzle blast. I guess Kimber has done an excellent job on the stock and the muzzle break design. The recoil was considerably less than my featherweight .270. I did notice a detectable creep in the trigger, which is a problem that can be easily solved with Kimber’s adjustable trigger. It breaks light enough, around 3 lbs. I was shooting off front and rear sandbacgs. Accuracy on my first five shot group was so so. . around 2.5″. I decided to try a couple of groups off a bi-pod. Sometimes a different or more consistent pressure point on the foreend can make a difference. Since the barrel was just breaking in, I gave it a thorough scrubbing with copper solvent, attached the bi-pod, and got ready to shoot another group. First, I set up my chronograph to determine the actual muzzle velocity of the Nosler 165s from my 22″ barrel. I shot off the bi-pod using just a small sand bag rest under the heel of the stock. Because of the rifles light weight, I held the forend lightly just ahead of the trigger guard to control jump. The first round was through the clean bore and printed a little high and to the right. Not unexpected. The next four printed a nice .82″ group with only .4″ vertical dispersion. With a crosswind blowing at around 10 MPH, I thought this was excellent performance for such a light rifle. I’ve recently read a shooter’s review of the Mountain Ascent posted on the net where the rifle printed large groups (3″) with Nosler 165 Accubonds while getting 1.2″ groups with Nosler Partitions. The author noted that ultra-light rifles are generally much more picky about ammo. You need to find the right load. His best groups were with Federal’s Vital Shok P308TT4, .308 High Energy shooting the 165 Trophy Bonded bullet at 2880 FPS. That’s the next one I’ll try, along with Hornady’s 165 Interbonds. While happy with the accuracy of the Nosler load, I was a little disappointed with the velocity out of the 22″ barrel which averaged 2680 FPS. Nosler advertises the load at 2800 FPS out of a 24″ barrel. While a lot of variables come into play, I had expected a loss of 50-60 FPS due to the shorter barrel which should have left the round at 2740=2750 FPS. I would prefer the higher velocities of the Federal or Hornady loads if the accuracy is comparable. We will see how it turns out !